Australian Chrysoprase. This quality and color of the stone is very difficult to find these days, this stone has an inner glow and has translucentcy. Chryoprase is a stone of pure Joy. Helps with depression, mood swings, hormonal imbalances, heart chakra balancer. 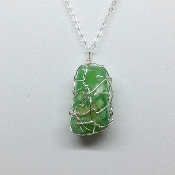 Australian Chrysoprase on 925 silver 17 inch length. Center stone: 1.125" x .625" x .5"